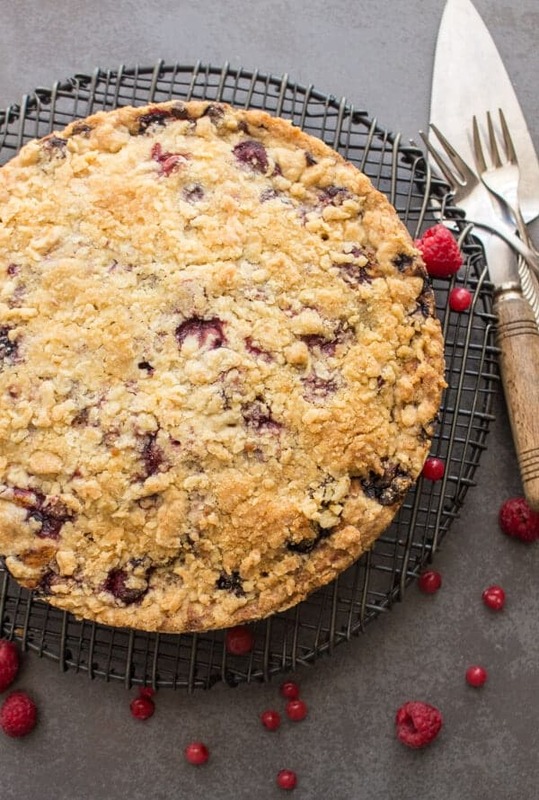 Wild Berry Crumb Cake, a delicious cake filled with wild Berries and a delicious Buttery Streusel Topping. The Perfect Snack or Dessert Cake. I know a lot of you are just getting over your delicious Thanksgiving Dinner, Turkey, stuffing and the works and here I am offering you another slice of cake! That’s ok it’s the holidays. But I have to say, every time I make Muffins or a Crumb Cake, I always have the Italian asking me “why don’t you add some “frutti di bosco” (berries) to the mix, I’m sure it would work” so to make him happy, that is exactly what I did. And to make me happy I made a buttery crumb topping! Can’t go wrong with that. Sometimes I find a crumb topping so much more delicious than a frosting. I don’t know about you but red berries always remind me of Winter and Christmas. I love the deep red colour and the taste is amazing. 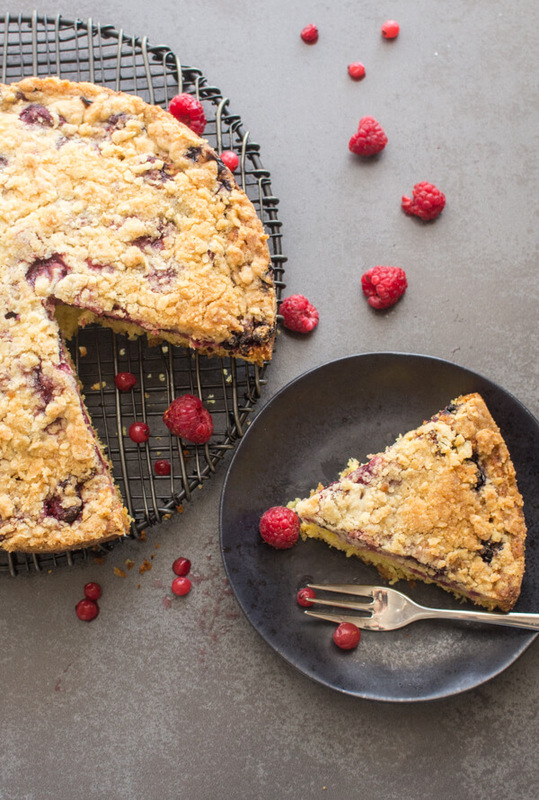 For this Berry Crumb Cake I used frozen berries, which gives the cake some extra moisture, but fresh would work also. Last year for Christmas I made a Fresh Cream Lemon Cake this year I thought (ok my husband encouraged me) why not Berries? The beautiful red Colour and flavour would be perfect! 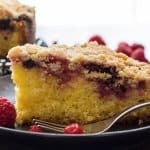 This Wild Berry Crumb Cake is very fast and easy to make, a simple vanilla cake topped with two cups of frozen berries and then the final crumb top layer makes this the ultimate Breakfast or delicious snack cake. If you don’t like red berries then frozen blueberries I am sure would work just as well. Enjoy! 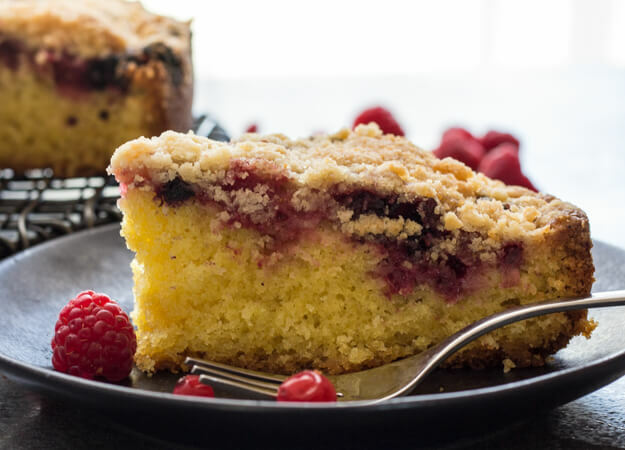 Wild Berry Crumb Cake, a fast and easy homemade breakfast, snack or coffee cake. 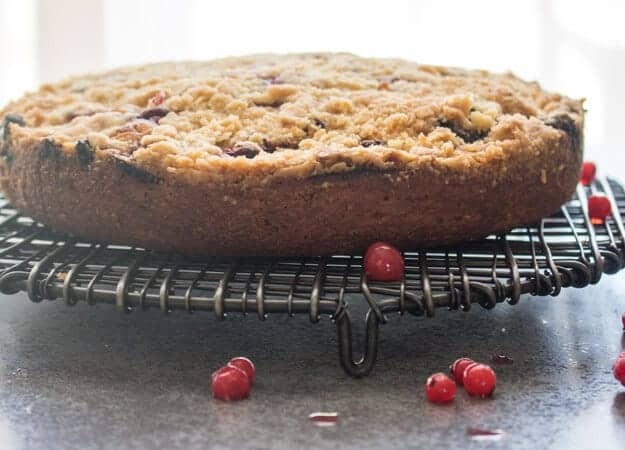 Red berries or blueberries make it a yummy cake recipe. Pre-heat oven to 350° (180° celsius). Lightly grease and flour a 9 inch cake pan. In a medium bowl beat sugar and butter until light and fluffy, add vanilla and salt and beat to combine, add eggs one at a time and yolk, beat 2-3 minutes, add flour mixture and with a spatula stir to combine. 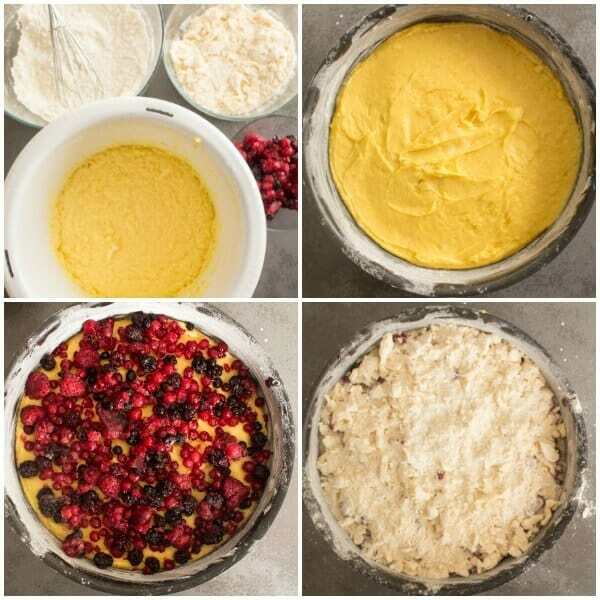 Spoon cake mixture into prepared cake pan. In a medium bowl whisk together flour, brown sugar and salt, cut in butter and combine to form coarse crumbs. Bake for approximately 50-60 minutes or until toothpick comes out clean. Enjoy! You put 3 eggs and 1 egg yolk. Did you mean 3 egg whites and 1 egg yolk? Hi Gabby, no it’s 3 whole eggs and 1 egg yolk. Hope that helps. 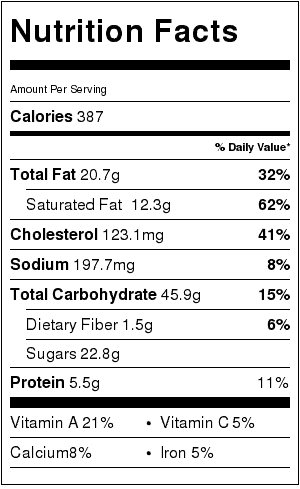 The first and second ingredients for the cake say sugar. Might the first be flour, as that is not listed. Hi Helen, thanks so much for letting me know, actually the first two are sugar and I totally left out the flour. Have a great week.